You've received your results! Now what does it all mean? ​We get it! 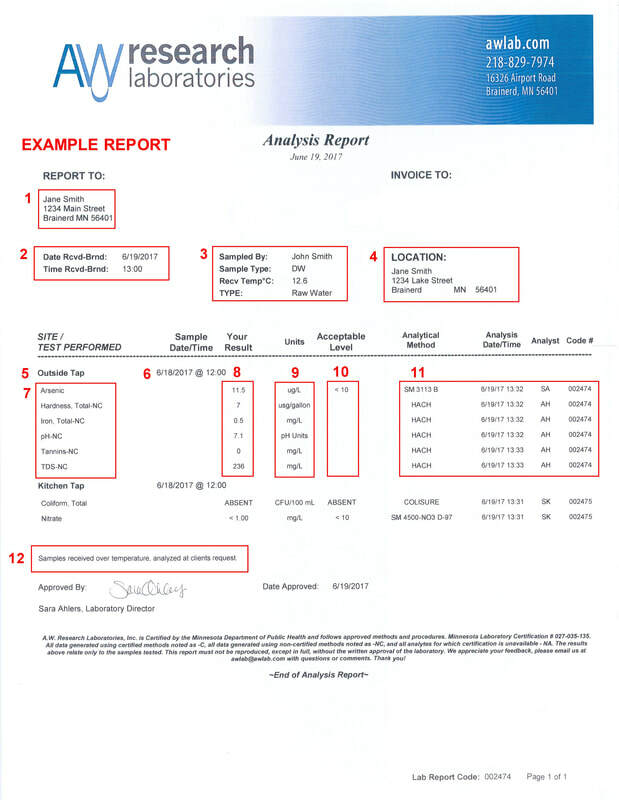 Lab reports can be confusing if you're not used to reading them, so here's some information to help you understand your report. The report below is an EXAMPLE. Refer to the numbered list to interpret each section of the report. ​Date and Time the sample was received at the lab. Name of person who collected the sample and general sample receiving information. (Sample Type: DW = drinking water). Location where the sample was collected. Specific site at the location where the sample was collected. Date and Time the sample was collected. List of tests completed for the site. Your result ( < means "less than"). Units - the unit of measure for your result. Acceptable level for human consumption (see more about acceptable levels in the table below). ( < means "less than"). Lab Information including: method used to analyze the sample, date and time analyzed, analyst's initials, and sample identification number. Comments - If your sample was received over temperature, in the wrong container, or any other special comments about the sample. Your results for each test are listed on the report under the Your Result column. Compare that number to the number in the Acceptable Level column to know if your result is considered safe for human consumption. ​For example, in the report above the arsenic result is 11.5 ug/L. The Acceptable Level is < 10 ug/L (less than 10 ug/L), so the arsenic in this water is too high to be considered safe for drinking. If you receive a "present" (aka. "positive") result, the water should not be consumed unless is it first brought to a rolling boil for at least one minute, or the well is chlorinated. Once the well has been chlorinated, another test should be done to confirm that total coliform is no longer present before the water is considered safe to drink. ​If your sample tested positive for total coliform bacteria, you will receive a packet in the mail with more information and a bottle for your retest sample. ​If your water has greater than 10.0 mg/L of nitrates, you will need to install a treatment system such as ion exchange or a reverse osmosis system. Contact a water treatment professional for more information. The simplest method to reduce lead exposure from drinking water is to turn on the cold water tap each morning, and let it run for a minute or two, until the water gets cold. This will "flush" the water that is standing in the plumbing pipes and components. You should do this for all faucets used for drinking and cooking. Flush the system any time the water has not been used for six hours or longer. In addition, hot water dissolves lead and copper more quickly than cold water; as a result, water to be used for drinking or cooking should not be drawn from the hot water tap. If you need hot water for cooking or drinking, take water from the cold tap and heat it. It is especially important not to use hot tap water for making baby formula. Click on the links below to download fact sheets from the Minnesota Department of Health.